Have you ever been in a foreign country in need of a translation? Or you stumble across a manual that’s only in foreign languages… Going to google and typing over all the text tedious. You may not even have a computer at hand (e.g. when you’re on the road) or it may not be connected to the internet. When you have a mobile phone with internet access, you could use go to google translate, but typing on a mobile phone is even more of a pain in the …er… fingers. For a final year course at the University of Tilburg, Seminar of IT, we have an assignment to create a mashup of various systems including Evernote. Evernote can recognize typed and handwritten text in images, via technology called ‘OCR’ or optical character recognition. It becomes much more than just a searchable image store, since you can take all your notes with you on an internet enabled phone, synchronize them with your PC, etc. There are many uses of Evernote. After exploring trivial uses of Evernote, we decided to make a more sophisticated application, called TranslateAnywhere, which integrates Evernote’s OCR and various other services to create a solution to the scenario explained above. Below is an overview of what happens. 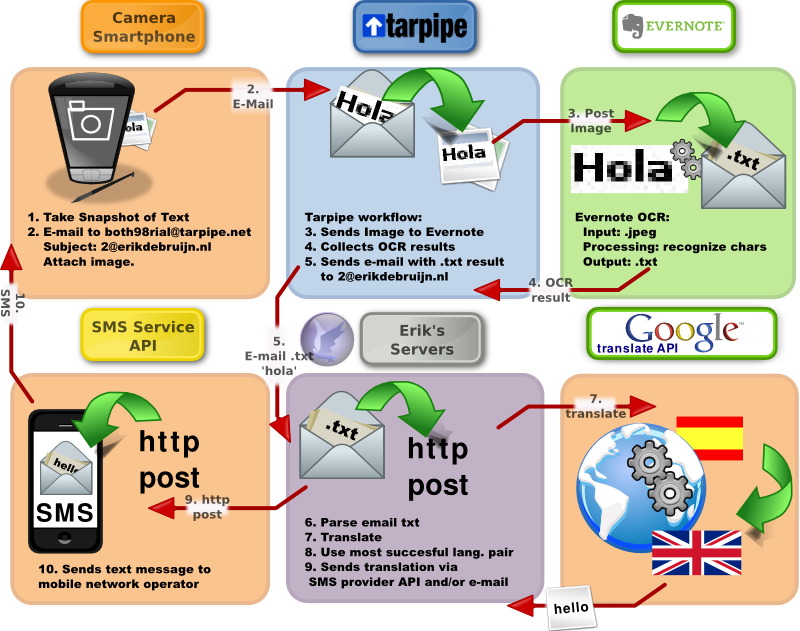 A snapshot is taken and sent to Tarpipe, which is a mashup tool. This tool posts it to Evernote for you and fetches the recognized text. 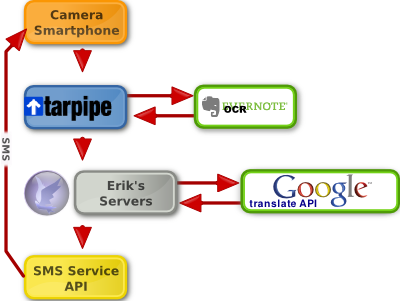 Tarpipe than forwards that text to my scripts that call the Google’s translate API for a translation. This translation is then sent via SMS. The result is received on the phone (within a minute under ideal circumstances). Figure 2: An informal activity diagram of our mashup. The proces starts at the top left. Follow the red arrows to see the actual processing steps. Each box is a ‘node’ in the activity diagram, activities performed by this node are numbered. View more presentations from gebbetje. Misschien een idee om het om te vormen tot Iphone App: vraag er een euro voor en je wordt slapend rijk! Je hebt ons versteld doen staan bij de ontwikkeling van DigiMaster. Ook deze vinding opent weer tal van toepassingsmogelijkheden! Wauw dit biedt mogelijkheden, supercool!! ziet er ook nog gelikt uit! let me congratulate you again for this app. good luck with everything. Let me congratulate you again for this app.